Military green isn't just a fall trend. Here is how to make military green work for summer. First you want to balance your military green color with a brighter neutral like white or cream. I choose to wear my green joggers with a fitted white halter top. 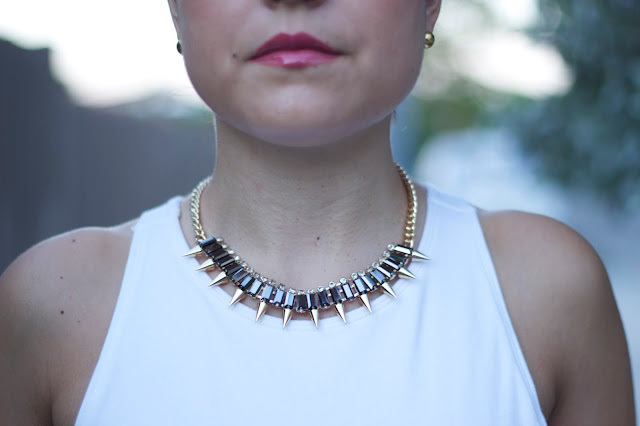 Styled my hair in a high bun to beat the heat and added my studded necklace form Rocksbox. I kept my bracelets and clutch neutral by doing brown, as well as my heels by wearing a green snake print but choose a magenta lip gloss to give the look some color. For some reason in summer I tend to wear more lip gloss…(random I know). Hope this look inspires you to wear your typically fall trend this spring!